NECOFA CELEBRATES CHRISTMAS WITH THE LESS FORTUNATE. Christmas may be the “season to be jolly” but not everyone gets to enjoy the festive spirit. While most of us come under the spells of carols and eagerly wait to open our presents, for a large number in the village, it’s just another day. Christmas is a period when people strengthen their relationships with their families. This is also the time the people help the less fortunate members of their society. Jesus in his teachings showed that we should always be caring for the less fortunate and we should all be our brothers’ keepers..So, to make this year’s Christmas a special one for the “not so fortunate”, Necofa decided to share Christmas with 46 households of vulnerable orphans and their guardians some infected and affected by HIV/AIDS to put a smile on their faces and to make them feel special and loved. And the joy of being part of the day was evident as the children and elderly adults danced away merrily to christmas songs. 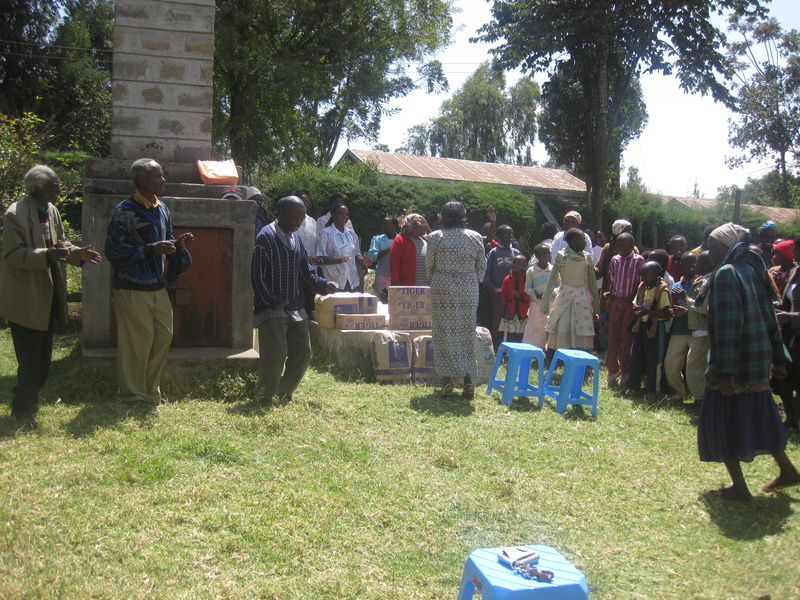 Vulnerable Orphaned children and their guardians sing as they await to receive their gifts. Necofa was among the stakeholders that joined Slow Food Central Rift Convivium in Celebrating Terra Madre day on 10th December at Marioshoni Primary School, Elburgon. The faces of the six hundred and thirty participants who graced the Terra Madre Day event – from different indigenous groups, different food communities and backgrounds – showed the diversity of the area and helped us in achieving our goal for the day; to celebrate our cultural biodiversity and food sovereignty. Mingling together, tasting different traditional foods – pumpkin chapati, mursik milk, deer meat, siwot vegetables, stinging nettle mukimo, forest honey among other flavors – and watching the moving songs and dances, the event was a day to remember. Kenya has experienced ethnic violence especially in the area that we were holding the event, and so it was inspirational to see the different ethnic groups chatting together, eating together and playing games together, proving the saying that “those who eat together never fight”. The Indigenous Ogiek community, whose members were present at the event, live in the Mau forest and are not used to mingle with other different tribes, but Terra Madre Day made it possible for them to showcase their traditional foods and culture, as they shared their experience with other participants. One of our aims of holding the event in this location was to give visibility to the community, who for a long time have been neglected. Alhough they live in an area with a lot of resources, due to lack of awareness they themselves often do not understand how they can utilize the resources within their reach to generate income for their households. Terra Madre Day was just a beginning. Slow Food Central Rift Conviviumin in collaboration with Necofa will embark on a baseline survey, to learn more about the Indigenous Ogiek community, their food traditions, culture and traditional knowledge, to establish how best they can be integrated in improving their livelihoods. Events like Terra Madre Day and others organized locally help us achieve our objectives; to educate on best practices in food production and taste education, bringing together food producers and consumers, document indigenous knowledge, promote indigenous knowledge transfer systems and promote environmental and biodiversity conservation. It was living proof that the communities of Terra Madre are moving forward with a purpose.